About this Maxi Plastic Mini Fan:Belt clip.Break-away lanyard.Material: Plastic with foam blades.Special Instructions:1 Day Rush, available upon request for 1 color, 1 imprint location orders. 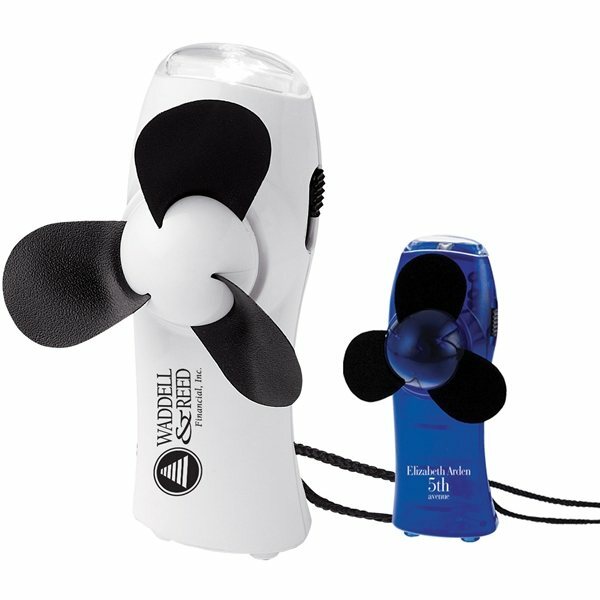 About this Twist - n - Chill Fan:Beat the heat with this unique and useful promotional product, the Twist and Chill Fan. When opened, it's a durable hand held fan. Twist to close for easy storage in purses or pockets. Great fund raiser: low cost - high perceived value. Perfect for outdoor events including concerts, sporting events, and county fairs.Special Instructions:Gold Rush Service not available on multi-color. About this Frame Crafted Folding Fan:Elegant folding fan with frame crafted out of eco-friendly, naturally sustainable bamboo.Made of heavy paper with smooth bamboo frame ribbing.Features a large easy-view imprint area.Perfect for weddings & customers in the heating/cooling industries. 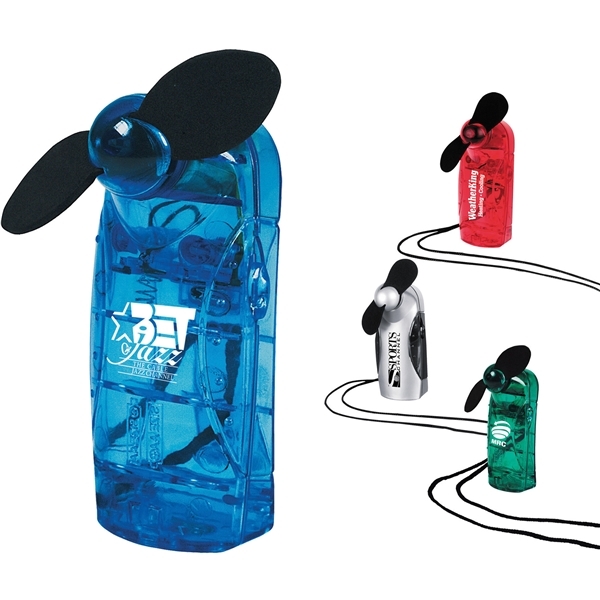 About this Fiji Water Pocket Fan:Pocket fan with small water container and spray for extra relief from the heat.2x AA batteries included.Material: ABS Plastic.Special Instructions:1 Day Rush, available upon request for 1 color, 1 imprint location orders. About this Breeze Foldable Hand Fan:Flexible pop-up fan that folds into plastic handle for easy travel.Including neck cord.Material: 190T Polyester.Special Instructions:1 Day Rush, available upon request for 1 color, 1 imprint location orders. About this The Breeze Mini Fan with Cap:Plastic fan with removable cap.Slide switch to turn power on/off.Material: Plastic. About this Cyclone Fan:210D folding hand fan.Easy to open and stays closed with elastic strap.Silver on one side, color on the opposite.Will ship flat. NOTE: Product comes with Prop 65 warning label. Label reads: "WARNING: This product may contain carcinogen, which is known to the State of California to cause Cancer. For more information, go to www.P65Warnings.ca.gov. Special Instructions:1 day rush is available on all in-stock items, one color/one location imprints, and laser engraved orders. About this Foldable Mini Fan:The Foldable Mini Fan features two modes power.It can stand on the Desktop or fit in your coat pocket when folded.It can consistently work for 1.5 to 2 hours.PCNA exclusive. Material: ABS Plastic.Special Instructions:1 Day Rush, available upon request for 1 color, 1 imprint location orders. About this Handheld Fan With LED Light:High Speed Fan With Soft Blades.2 Extra Bright White LED Lights.Slide Switch Down To Turn Light On And Up To Turn Fan On.Small And Portable To Fit In Your Pocket Or Purse.2 AAA Batteries Included.Special Instructions:Rush Service:Catalog Quantities Only.One Color And One Location. About this Hourglass Shape Hand Fan, Full Color Digital:Hourglass Shape Hand Fan, Full Color Digital. About this Square Shape Hand Fan, Full Color Digital:Low minimums.No set-up or plate charges. About this Portable Hand Fan with Holder:Stay cool with the Portable Hand Fan with Holder.Powered by USB or battery, this fan provides a cool breeze hands free or on the go! 3 AAA Alkaline batteries included.Material: ABS Plastic. About this House Shape Hand Fan, Full Color Digital:Low minimums.No set-up or plate charges. About this Circle Shape Hand Fan, Full Color Digital:Low minimums.No set-up or plate charges. About this Heart Shape Hand Fan, Full Color Digital:Low minimums.No set-up or plate charges. About this Coloring Paper Fan Set:The Coloring Paper Fan Set features the simple doodle drawing for kids and 4-piece colored markers in blue, green, yellow, and red.CPSIA and LHAMA compliant. Material: Paper.Special Instructions:1 Day Rush, available upon request for 1 color, 1 imprint location orders. About this LED Lighted Message Fan:LED Message fans keeps logo cool. Custom programmable LED message. 6 Lines of copy, 18 characters per line. Safety Breakaway neck lanyard. On/Off switch. Batteries included. About this Helmet Shape Hand Fan, Full Color Digital:Low minimums.No set-up or plate charges. About this Cowboy Hat Shape Hand Fan, Full Color Digital:Low minimums.No set-up or plate charges. About this O2Cool Large Deluxe Misting Fan:Stay cool with this popular misting fan! Ideal when you are in theme parks, at the beach or doing other outdoor activities. Large reservoir holds more than 1,000 mists. Fan function. Includes: AA batteries, not inserted.Material: ABS (Acrylonitrile butadiene styrene) Plastic. About this Transparent Plastic Hand Fan:Large fan area for maximum imprint exposure.﻿﻿﻿Material: Polypropylene Plastic. About this O2Cool Carabiner Misting Fan:Great for adults and families, the Carabiner Water Misting Fan provides both a powerful fan and mister for portable cooling relief wherever you go. Compact size. Soft foam blades. 2-in-1 Misting Fan: Powerful Fan and Cool Mist Option. Include carabiner to easily attach on bag, belt loop, etc. Includes: AA batteries, not inserted.Material: ABS (Acrylonitrile butadiene styrene) Plastic. Thank you Barbara, Joanie and Terri! The Foldable Nylon Fan is a huge hit in our promotional fans selection. The Foldable Nylon Fan is a great tool to help keep you cool in any location. Since it folds down, you can simply store it in any bag! Take it with you everywhere to give you a cool breeze. The Foldable Nylon hand held fan is a great give away for those summertime rallies. Its elegant circle design allows for a large imprint area and to store it simple fold it away into its handle and slip it into your pocket! Convenient and practical, there no better item for those outdoor events when the heat is high! Available in three different colors and multiple imprint colors. Available in red, blue, white, and green. Thank you Dierdre and Noa! We’re glad you read your positive reviews on our Maxi Plastic Mini Fan. We know how popular this item is within our promotional fans selection. The Maxi Plastic Mini Fan is great if you have no energy to move your hand with a hand fan. These hand held fans will help give you the air you need to stay cool. Order your Maxi Plastic Mini Fan here. Thank you Kaden and Riley! We’re glad to read your reviews on our top selling Turbo Mini Fan/Flashlight. We know this is a hot product year round! Available in transparent blue, and white. With our selection of promotional fans available, you’ll find the perfect one to fit your company’s personality. We have mini plastic fans, folding fans, fan/flashlights, usb fans, desk fans, hand fans, keychain fans, desktop fans, cellphone fans, hand held fans, and more! Fans are great to beat the heat! You could stay cool with all of our promotional fans available. Want to go for humor? You could give a fun promotional message with fans by letting your customers know that you’re their number one fan. Promotional fans could be given to just about everyone! Have fun with all the promotional fans available. Look through our selection of fans. Shop here! Trade show and event guests are bombarded with lackluster swag at every opportunity, so it is extremely important to stand out. Our custom fans are specially priced and proven to generate impressions and fun. Search our site for a wide selection of promotional fans and see for yourself how high our standards are when it comes to brand impact! Click through our inventory of promotional fans on sale now. Here is a snapshot of our selection of 1,711 custom fans currently available. We’re ready to help expedite your order, so give us a call! Grab your promo fans today! Promotional fans could be a great giveaway for any trade show. You never know when a heat wave is coming. Better to be prepared with a fan at your side. If you’re aiming to do a giveaway before or during summer months, then promotional fans are perfect! Don’t miss out on this great marketing tool that can help keep you cool all summer. Our featured list of fans consists of different styles that have began to trend on this category. When it comes to fans, you’ll definitely get your message across.